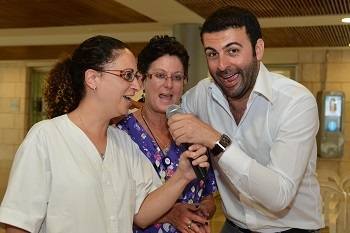 French Baritone Opera Virtuoso David Serero performed in the atrium of the Hadassah Medical Center’s Sarah Wetsman Davidson Hospital Tower on July 18. Often playing leading roles in operas and musicals, the internationally acclaimed singer has given over 600 performances. Once again, he entertained at Hadassah, with no charge, fulfilling his promise to give recitals at the hospital whenever he is in Israel. Mr. Serero sang Broadway musicals and arias by Mozart, Verdi, and Bizet and other songs from around the world. The president of Young Hadassah France, Mr. Serero particularly enjoys performing at Hadassah because of the multicultural nature of its patients and staff. The diverse audience of all ages enthusiastically sang along with him.